Nina Simone probably won’t be a familiar name to primary graders, but that doesn’t matter much in this captivating book focusing on the young Nina and how early events in her life shaped her adult passions. This begins with Nina singing a lullaby she’s written to her daughter. At bedtime, she tells the child stories of her own youth. When she first saw a piano, she noticed the black keys were smaller than the white ones—and that could have become a metaphor for the world. “Black people were nothing but half notes on a huge ivory keyboard. But no. I did not agree with this.” Another incident, after she’s become an accomplished musician: at a concert, her mother is seated up-front until white audience members arrive. But Nina won’t play if her mother must move, so her mother stays put. Later, Martin Luther King becomes “her symphony.” But his dream must be nurtured, she murmurs as her daughter sleeps. This French import is strikingly illustrated in black-and-white. A two-page spread in which white people sit, while black people stand behind them, arms raised, conveys a historical drama made even more powerful by the medium. Perhaps because of its French origin, there’s no author’s note, nothing that further details Simone’s career. But this stands on its own. 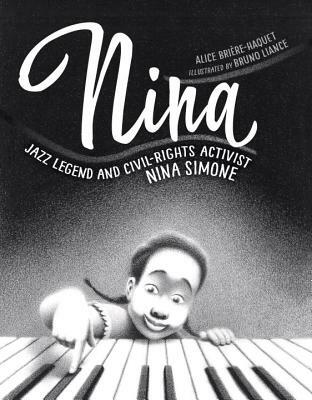 A soft lullaby sung to comfort a sleepy little girl turns into theinspiring story of remarkable musical talent blossoming in theface of racial inequalities in Nina: Jazz Legend and Civil-RightsActivist Nina Simone, by Alice Brière-Haquet. Hauntingly beautifulillustrations from Bruno Liance are in shades of black and white,light and shadow, to cast a dreamlike resonance over youngNina’s piano playing as she notices, reflects, and rises above theprejudice around her. A biography about the legendary singer told as a lullaby from Simone to her daughter. With black-and-white illustrations that evoke a dreamy, old-time feel, Simone (appropriately portrayed with an afro) sings her daughter a lullaby interspersed with the story of her life. At 3, Simone starts piano lessons, connecting the appearance of the piano keys to the oppression of black people in the US. Music offers Simone an escape (“Music has no color”), though the fact that the “important men in powered wings from past centuries” whose music she plays are all white is addressed only in the illustration. (Here young Simone is also depicted with white hair which will probably require some assistance from caregivers to unpack). When 12-year-old Simone gives a church performance, she refuses to play until her mother, who had given up her front-row seat for a white attendee, is reseated in the front row setting a precedent for her activist future. Dr. Martin Luther King Jr. is cited as an inspiration (though without the honorific), and a spread with protest signs adds humor with Simone happily pointing to her own sign, which reads, “Young, Gifted, and Black,” a nod to her future song. Though the softly textured illustrations in this French import are sometimes obscure, they are always beautiful. A good introduction to Simone’s life, from her early love of music to her rise to the status of legend. A mother sings her restless child to sleep, offering up a story from her own childhood to help ease the transition to bedtime. The mother is Nina Simone, talking about her own girlhood and the discrimination she faced as she came into her own and discovered her love of music. The adult Nina, looking back, remembers a church performance at the age of 23, during which her proud mother was asked by white people to remove herself from the front row where she planned to watch her daughter perform. Author Alice Brière-Haquet uses a set of piano keys as a metaphor for the racial injustices of the time: “Black people were nothing but half notes on a huge ivory keyboard.” Later, the adult Nina tells her own child that Dr. Martin Luther King Jr.’s dream of racial harmony helped turn the tide. Here, illustrator Bruno Liance brings readers black and white protesters with signs; young Nina herself holds one that reads, “Young, Gifted, and Black,” referencing her 1970 song that became an anthem of the Civil Rights movement. Liance’s illustrations—soft-focus and hazy, just as memories are wont to be—are in black-and-white, matching the author’s sentiment: “Music has no color.” There are moments of great drama on several spreads. More than one features lush trees or flowers bursting forth in unexpected places (from a piano, from the bed of the child Nina is lulling to sleep). One features a line-up of white composers (Mozart, Liszt and the like), followed by young Nina, the only black person pictured, who “played all the important men in powdered wigs from past centuries.” A couple of spreads show a defiant Nina, pushing down her anger to sing to her dismissed mother in the crowd. Stirring and powerful, the book can be an effective conversation-starter with children about racial injustice.